The Arnold Podiatry Clinic (formerly Arnold Chiropody & Podiatry Clinic) is run by husband and wife partnership, Kevin and Sarah and has been in Arnold since January 2006. In this time, the practice has grown from a single room clinic into a 3 room practice with 3 Podiatrists, all of whom are registered with the Health & Care Professions Council (HCPC). All Podiatrists working within the NHS are registered with The Health and Care Professions Council and it is the only registration accepted by Health Cash Plans such as Westfield Health Insurance and Simply Health (formerly HSA). Kevin qualified from Matthew Boulton College, Birmingham in 2004 and has worked in private practice ever since. In 2006 he joined forces with his wife Sarah and opened Arnold Podiatry Clinic (formerly Arnold Chiropody & Podiatry Clinic). Together, they have built a thriving practice, employing 3 Associate Podiatrists and 2 receptionists/administrators. He has 3 children, Connor, Saffrone and Rosie. Kevin is an active sportsman having played cricket for Nottinghamshire U17’s and U19’s and football in his early years. In 2013 he completed his 1st Marathon (London) and has since gone on to complete 4 more completing the inaugural Birmingham International Marathon 2017 in 3hrs 13mins 45sec. Kevin’s main Podiatric interests are the treatment of ingrowing toenails and the SWIFT treatment for verrucae. He also enjoys biomechanics and orthotic prescription to aid lower limb function and utilises acupuncture for musculoskeletal pain management of lower limb pathologies. Sarah gained her Batchelor of Science degree (BSc) from Matthew Boulton College, Birmingham in 2005 and moved into private practice. 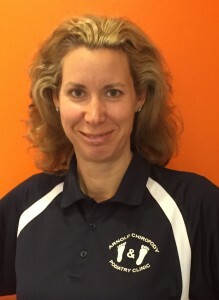 She joined forces with her husband Kevin and started Arnold Podiatry Clinic in 2006, turning it from a small single room clinic into what is now a well established and respected clinic within Arnold and the surrounding areas. Now a mother to Rosie, Sarah works 3 days per week and employs 2 receptionists and 3 associate Podiatrists. The clinic primarily provides general nail and foot care, but Sarah also has a great interest in Diabetes and Dermatology and attends many conferences and courses each year in order to enhance and update her knowledge base. Richard qualified as a Podiatrist from the University of Huddersfield in 2005, gaining his Batchelor of Science Degree (BSc). He later returned and completed his Masters Degree (MSc) in 2013. Having started his career in the NHS, based at Newark Hospital. Richard moved into private practice in 2009, joining Arnold Podiatry Clinic as an associate Podiatrist and now works solely in the Private sector. Richard is a member of the Society of Chiropodists & Podiatrists and is registered with the Health & Care Professions Council. 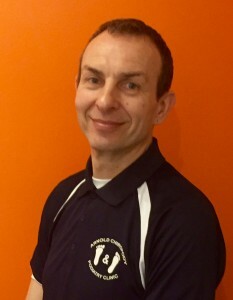 Richard is a big sports fan, enjoying all sports but especially, football, cricket and rugby and has coached at Leicester Ladies FC and Arnold Eagles Ladies FC. 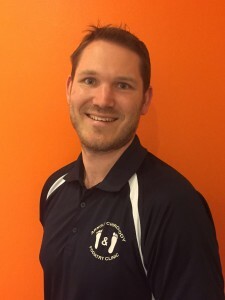 Richard is keen to promote the Podiatry profession and is always willing to give talks on the benefits of footcare and the importance of Podiatry.